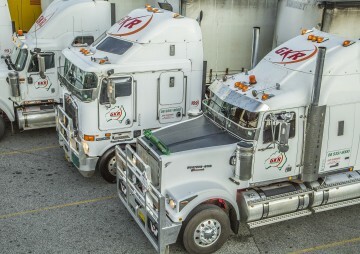 GKR Transport specialises in east-west and return road express freight, with our express service (three days) providing daily pickups, as required; we depart twice weekly to and from Perth, Adelaide, Melbourne, Sydney and Brisbane. By operating a modern line-haul fleet of 45 prime movers and in excess of 100 trailers we are able to provide an efficient and cost-effective transport service to our wide array of clients. Our fleet contains flat tops, drop decks, taut-liners, mezzanine floor taut-liners and extendables, which are available in B-Double, B-Triple and Road-Train configurations. All our prime movers and trailers are operated under the guidelines of the National Heavy Vehicle Accreditation Scheme (NHVAS), Western Australian Heavy Vehicle Scheme (WAHVS) and are compliant with current driver fatigue management regulations. We always put safety first and are appropriately certified in all areas of Occupational Health and Safety. With our main terminal and head office located in Perth and depots situated around the country we are well positioned to provide you with an efficient transport and logistics service no matter where your business is situated. Our head office also operates a state of the art Workshop facility for in-house repairs, servicing and maintenance of our fleet. Class 7 (Radioactive material) consignments can be priced on application, by contacting our sales department. It is the responsibility of the consignor (sender) to declare and provide appropriate Material Safety Documents Sheets (MSDS) for adherence and compliance to the Australian Dangerous Goods code for transportation.